Mountain Colors, located in Montana, takes Targhee roving and hand dyes it into a variety of colorways inspired by the Rocky Mountain West. The fiber is not carded after dyeing, so the colors remain distinct from one other rather than blended. The Targhee breed was developed by the U. S. Deptartment of Agriculture to thrive in the arid rangelands of Montana, Wyoming, and South Dakota. The wool is fine, dense, and lofty, with a short staple of 3-4 1/4 inches. The fiber has a diameter of 58-64s or 27-22 microns. It has definite crimp but little luster. Because of the loft and elasticity of Targhee, it is often used in garment fabrics, where it holds its shape and resists creases. While it doesn't felt as fast as Merino, it does felt well, and is an excellent choice for wearables such as hats and scarves. Because of the short staple, it is not suitable for high-wear items such as carpets, as the fibers will pill over time. In blends, Targhee can add loft and elasticity to fibers that lack them. 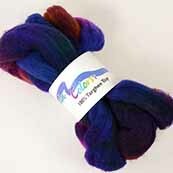 Mountain Colors Targhee Roving is packaged in 4 ounce bundles.